The OneLife Network is proud to announce yet another impressive milestone on its path to success. Just hours before one of the most anticipated events in the OLN’s history – the Mastermind in Bangkok, the OneLife Family has now reached the 2.5 million mark! The OneLife Network (OLN) is a growing global network that was born out of the OneCoin cryptocurrency brand. The Network is part of a digital platform with a unique ecosystem of sophisticated products and social networking tools that help members achieve financial independence. Members enjoy access to an array of e-learning programs that help them apply financial theory to practice. This allows them to understand, mine and trade cryptocurrency, and make secure, low-cost, cross-border transactions. OneCoin is disappointed that the FCA has issued a statement without having first contacted the company. OneCoin has not been contacted by the City of London Police. No allegations of any wrongdoing have been put to OneCoin and the basis for and scope of any investigation has not been explained. OneCoin is a global software and technology company, with offices in Bulgaria, Hong Kong and the United Arab Emirates, which has developed a cryptocurrency. It shares some features with other digital currencies, but has a unique centralised model, which includes maintaining a database record of each transaction and client and the implementation of Know-Your-Customer (KYC) rules. These measures help protect its clients. OneCoin is committed to following good business practices and the relevant rules and regulations in the countries in which it operates. It will co-operate fully with the authorities in pursuit of this objective. The OLN is proud to welcome the latest addition to the OneLife Family - the WeShare community! After confirming the deal, over 75 000 people, primarily from Europe and Asia have joined over 2.3 million Members of the OneLife network worldwide, enhancing the OLN’s global footprint. The members of the WeShare community will also have the opportunity to benefit from the expansive selection of products and services the OLN has to offer - a unique ecosystem of sophisticated products and social networking tools that help members achieve financial independence. Members enjoy access to an array of e-learning programs that help them apply financial theory to practice. This allows them to understand, mine, and trade cryptocurrency and make secure, low-cost, cross-border transactions. In addition to the educational packages, the OLN recently launched its new premium line products, starting with the OneTablet, and many more are soon to come. The OneLife Network’s vision is to provide alternative payment solutions and equal access to financial education to people worldwide. The OLN makes financial transactions and trade safer, easier, and available to everyone on the web. Our ecosystem of virtual tools and services holds the potential to open new economic markets for cross border trade and to stimulate economic growth. Born out of the OneCoin cryptocurrency in 2014 and officially launched in July 2016, the OLN has quickly become the fastest growing company in Network Marketing history thanks to its innovative business concept and strategy. "Det verkar som kryptovalutan OneCoin - OneLife Network växer snabbare än någonsin, ett växande antal av ledande professionella nätverksmarknadsförare ansluter sig till möjligheten. Mer än 10.000 personer kommer närvara vid det slutsålda OneLife Network Mastermind konventet i Bangkok, Thailand. Denna händelse kommer innehålla; företagsuppdateringar, utbildning, som utförs av några av de bästa nätverksledarna, OneLife exekutiva och marknadsledare och nyckeltalare, som kommer ge marknaden insikter och ledarskapsråd för alla gäster. Intill september 2016 har mer än 2,3 miljoner medlemmar anslutit sig till OneLife Network. OneCoin är officiellt skild från marknadsföringsnätverket, som skyltats om till OneLife Network (OLN). OneLife.eu är online navet för nätverket med över 2,3 miljoner OneCoin användare. OneLife Network webbplatsen erbjuder information om nya produkter, såsom den första fysiska OneCoin produkten - OneTablet, som också presenterades på ett globalt event. OneAcademy.eu är den nya hemsidan för OneCoin en svit av innovativa, kryptovaluta undervisningsmaterial. 6 utbildningar är nyligen ombyggda för att återspegla den senaste finansiella utvecklingen, och några av de mest framgångsrika internationella företagsexperterna avmystifierar kryptovaluta genom att erbjuda OneAcademy studenter med lysande lektioner. "Vi byggde ett miljard-euro företag, som finns i över 190 länder och 6 kontinenter, och vi visar världen, att vi är mycket mer än bara en kryptovaluta", sade OneCoin grundare och visionär Dr. Ruja Ignatova. "Vi är mycket stolta över våra nya utveckling och kommer att fortsätta att förnya, förbättra och excellera". Have you visited OneLife.eu recently? If so, you’re not alone. The online hub for the OneLife Network – one of the world’s fastest-growing direct sales and network marketing companies – is a must-visit location on the web! Plus, OneCoin.eu remains a top-ranking cryptocurrency website too! The OneLife Network continually improves its offered products and services – and we thank all Members for making our website a hot online destination. While over 2.3 million Members around the globe have joined our amazing project, which aims to revolutionize finance, there are still number of skeptics who question OLN success rates. 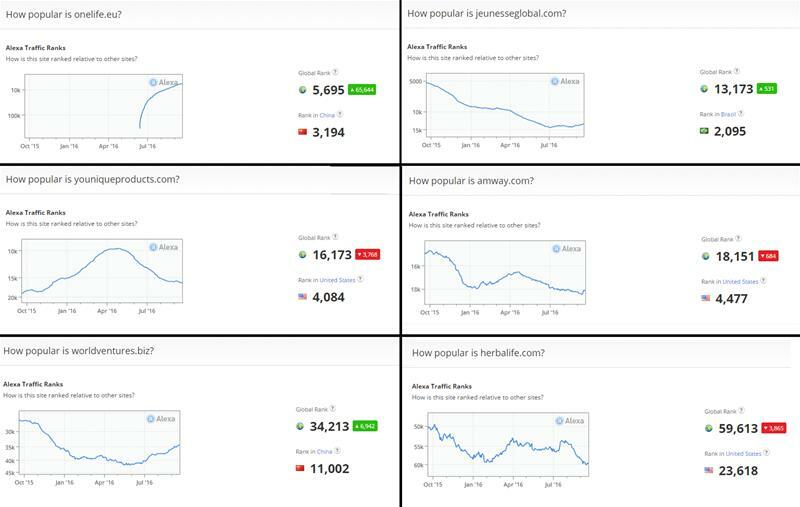 We’ve even heard these skeptics or competitors say that our website numbers are down. So, we’ll let you take a look for yourself. 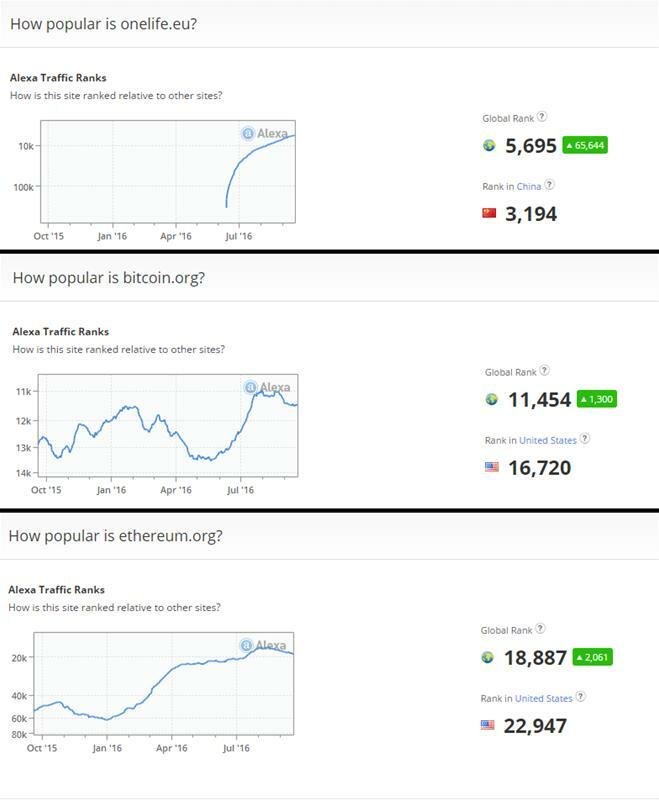 Here are some charts from Alexa.com – a reliable source that tracks and ranks website traffic. The search results for many cryptocurrencies are constantly rising, which proves there is a growing interest in digital money in general. Here, you see how all three websites have bounced up the rankings, with an exponentially-increasing traffic curve for OneLife.eu and 5,695 ranking worldwide (which is HUGE given the amount of websites available). Please do note that the OneLife.eu website was launched in June during a company rebranding and OneCoin.eu still generates notable website traffic figures. Plus, in comparison to other direct-sales companies, the ever-increasing traffic to the OLN website is exceptional! Here are charts showing OneLife.eu and some of the other major players on the direct-sales scene and you can see traffic to OneLife.eu is SOARING. As you keep visiting the website, we’ll keep updating, improving and adding to it. As we say: Together for more! Hacking challenge complete! OneCoinCloud proved impenetrable! During the past three months over 300 hackers attempted to break through our state-of-the-art security system to receive the 100,000 EUR or 100,000 OneCoin prize. None of them managed to hack the system, which proves that our encrypted cloud storage system is one of the safest places for your files! OneCoinCloud is a unique cloud storage platform exclusively offered and developed for all OneCoin members. We take pride in the level of protection and security the company provides and we can GUARANTEE that the OneCoinCloud storage does not fall short on that promise. It is one of the most secure cloud storage solutions available on the market and it protects YOUR files, even from us! Our team is not able to access any of your decrypted, hosted data. We have zero knowledge about your files and all of the information you store in your account is automatically encrypted on your devices, so YOU are the only one who has the key to lock and unlock that information. Interested in purchasing the OneCoinCloud? CLICK HERE TO SEE THE PACKAGES. Amazing news for our Members in Chinа! On September 12th we introduced a new payment feature - OneLife Members will now be able to complete pay-ins to the company with their China UnionPay cards! The limit per transaction is 2M CNY, or 6M CNY per day. We would also like to inform Members, that they will have to wait 20 minutes before executing a second transaction. Proving how you can achieve in the OneLife Network without spending any money at all, 96 OneLife members earned promotional tokens in just one week without personally purchasing any products or services. From Monday, August 29th to Monday, September 5th, 2016, 92 OneLife members received 1,000 promotional tokens each (equivalent to the level/rank of a “Starter”) simply through purchases made from their customers; an additional member received 5,000 promotional tokens (that of the “Trader” level/rank) simply through purchases of his/her customers; and three members earned 10,000 promotions tokens (that of the “Pro Trader” level/rank), again, simply through purchases of his/her customers. People often ask “Can I join the OneLife Network and receive promotional tokens without buying any products or services?” and with so many people using a free membership to receive tokens in just one week, the answer is clearly YES. Simply by joining the OneLife Network for free and getting customers, you can earn promotional tokens. For clarification, the tokens are instruments provided by the company on a promotional basis that provide access to the OneCoin mining pools. (Please do note that the company does not guarantee that your tokens will mine coins, nor how many coins can be received). “Happy mining to the nearly 100 members who just stocked up on their tokens this week through hard work; you are showing the world the strength of the Network,” added Dr. Ignatova.